In my years of doing events I realized that wedding, more than just a celebration, is a lifetime event that will test your decision making. You deal not just with your fiancé but with different people that matters most in your life. Deciding on the key elements such as type of ceremony, wedding theme, color motif and so on and so forth will never be just between the two of you. As a Filipino custom, we try to always put into consideration what our family members will say especially the parents and in-laws. This however, should not keep you from having the wedding that you want. Keep calm as today I’ll give you concrete tips on making decisions for your wedding without the chaos in between. After the engagement you’ll for sure be happy to inform everyone in the family by posting a photo or a Facebook status right after. This can be the start of the wedding planning. Make sure that you check with your fiancé the wedding that’s in your mind. Will you go for a Civil wedding or a Church Wedding? Selecting the theme of the event is important as this is where your invitation, set up and venue will depend upon. For example, if you are thinking of a Beach Wedding, you’ll most probably select a skyblue color motif and have a venue near the beach (destination wedding). Same with thinking of a Chinese Wedding wherein red and gold will most probably be the color moti while venue should be a Chinese Restaurant. Let’s be honest here, a wedding is a big investment. Most Filipino wedding budget has the minimum amount of 75,000pesos depending on how extravagant the event will be. You might also want to discuss who’s paying what in the wedding needs. Of course as per tradition, most Filipino groom will have to pay for the wedding needs but currently a balance in between the engaged couples is happening. In my years of talking to couple preparing for their big day, the common pain they experience is finalizing the guest list. You may have set yourself to 100 guests and then as soon as you are typing the names already you’ll realize that the number you set is not enough. You also need to consider the people that your fiance would want to invite with. Come up with a draft first of the guests you wish to invite and from there build your final guest list. 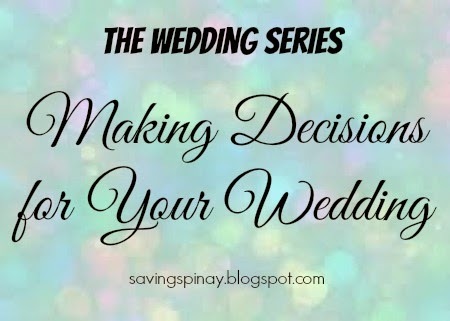 The mentioned above are just four of the long list of decisions you will face once you go to the process of a wedding. It is truly a once in a lifetime event so each and every decision is crucial. This is why wedding planners were born, to ease out the daunting task and give expert advice. The answers and decisions from the list above will play a vital role for the success of your wedding. Remember that since you are now considered as one (engaged), both families will have a say on the decisions you are going to make. One important advice is TO TALK TO YOUR FAMILY FIRST RATHER THAN THE IN LAWS. For example, Bert as the future groom, should talk first (alone) to his family rather than informing the future in-laws. This is to make sure that there will be no conflict from the start of the event. Also make sure not to keep any secret or hidden sama ng loob as that might cause a family war.